Well almost exactly a year after my last post regarding the last Woodworking Show. I again attended and returned home yesterday. This year’s started a bit late for me as due to weather I had to work in the morning on Friday and did not get there until later in the afternoon. However I made up for it by staying until they turned the lights out. I was attending a very small seminar by Bradly McAllister on selling your work. He covered some basic pointers and such. Great guy and enjoyed talking to him then and later in the weekend. Quite happy that he did a hands on session for a few kids as Craft Supplies is not with the show at this time. So that means there is no hands on for the crowd. However, I did get there earlier enough to participate in the CNC demonstration by Legacy Woodworking. This is what he had programmed in. 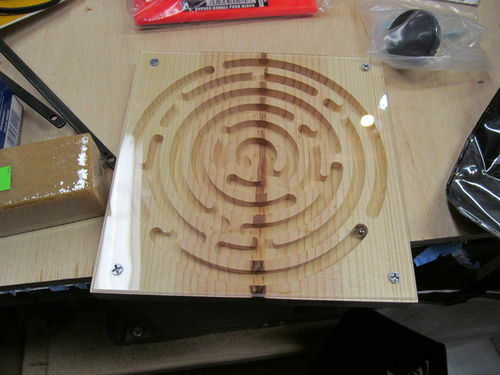 We did the complete piece on 2 different machines (one to do the labyrinth the other to cut the plexi and do the engraving) and it took all of about 10 minutes. For my games it is certainly something to entertain in the future. But right now the price is a bit out of my league. It was great to meet up with a few LumberJocks and catch up. I of course did some shopping. First things I planned to focus on was my new lathe, so I bought a few tools, a Ron Brown top making set (which included his Speed Gouge), and some finishing products to try. Looking forward to putting them to use, as soon as the lathe is set up.. but that is another blog coming soon. Also purchased some Dust collection pieces. 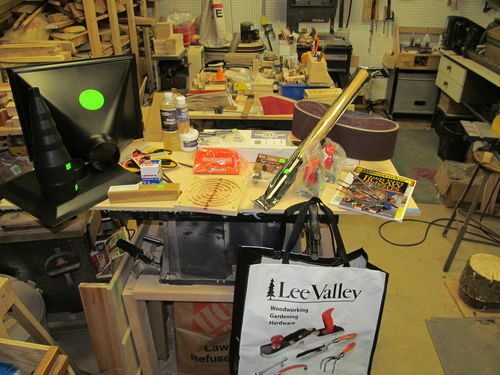 The larger one you see is for my Table saw and I will post how that worked in my other blog. I am happy to say though that I already have it installed. I of course bought a lot of smaller stuff as well. A great deal on the Sanding Paper in 4 different grits for my table sander. certainly looking forward to putting that to use in smoothing out some of my games on that instead of by hand. All in all a decent show, even though I thought some of the seminars were a bit redundant from previous years. Sounds like you enjoyed the show, learned a few things, and best yet, brought home some goodies. All part of what we really enjoy.